June is one of the most joyful months of the year on campus. It’s a time when our students delight in finishing up finals and make plans for the summer, and our graduating Anteaters depart our campus ready to make a difference in the world around them. 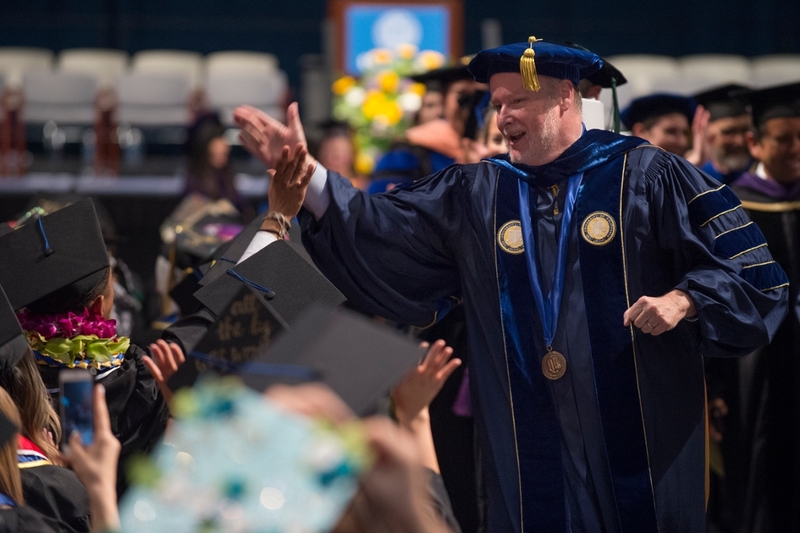 This past weekend, more than 7,500 students participated in commencement ceremonies – but in total, UCI granted more than 10,000 degrees this year. And more than half of those who earned bachelor’s degrees are the first in their families to accomplish such a feat. Among the Class of 2017 are remarkable individuals who have found a way to put purpose behind their passions and who will use their newfound knowledge to do good and thrive. Some might say UCI is a bit like an incubator for young minds – nurturing our Anteaters until they are strong and wise and ready to stand on their own. For Brianna Miner, that sentiment is particularly fitting. The recent graduate from the School of Medicine and her three siblings were the first set of quadruplets born through gamete intrafallopian transfer, or GIFT, at UC Irvine Medical Center. When she walked across the commencement stage in Aldrich Park, she was hooded by the very same doctor who delivered her more than 25 years ago, Dr. Manuel Porto. Brianna will spend her residency in Chicago specializing in emergency medicine. Her heartwarming story was featured in the Orange County Register and on KTLA and ABC News. Our bachelor’s degree recipients are equally inspiring and include future professors, nurses, lawyers, researchers, engineers and leaders. Daniela Estrada, a Fulbright and Truman scholar who earned a B.A. in political science, will spend her summer teaching English in Colombia before starting law school. 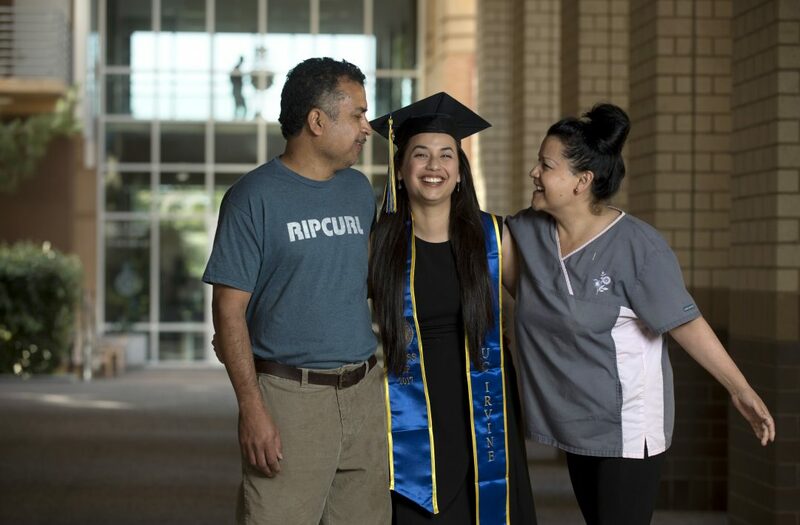 The first-generation college graduate says much of her success stems from her parents’ support and the resources found at UCI, such as the SAGE Scholars Program, which provides leadership training, career planning and access to scholarship opportunities. You can learn more about some of our other outstanding graduates here. UCI is once again No. 1 on The New York Times’ College Access Index, recognizing the U.S. universities “doing the most for the American dream.” The ranking answers a vitally important question: Which of America’s colleges and universities offer the best access, opportunities and outcomes for low- and middle-income students? Topping The New York Times’ list for the second time is a sound reminder that UCI is fulfilling its commitment to provide California’s brightest young people a world-class education and the chance to pursue the lives they want to lead as productive and informed citizens. 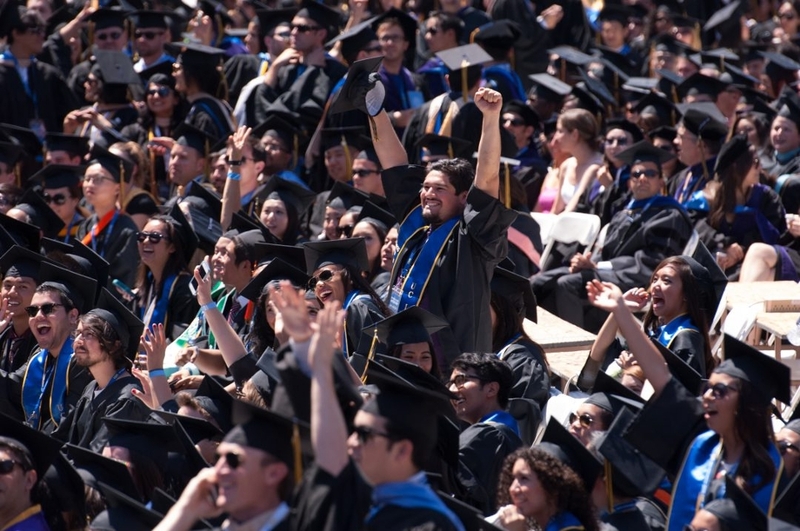 This ranking is the latest in a landmark year of achievement for the Anteater family, from being named the ninth-best public university in America by U.S. News & World Report to inclusion among Forbes’ 10 Best Value Colleges. UCI also was recently named a Hispanic-serving institution for 2017-18, meaning that fully one-quarter of our undergraduate student body identifies as Latino and that half of all students receive financial aid. The designation from the U.S. Department of Education builds on UCI’s recognition earlier this year as an Asian American and Native American Pacific Islander-serving institution. These classifications create opportunities to access federal grants designed to support students. If funding remains strong, the grants could be used for laboratory or teaching equipment, construction of instructional facilities, faculty development, academic tutoring, counseling programs or endowments. UCI’s designation was highlighted in a detailed piece by the Los Angeles Times, complete with firsthand accounts of the robust, diverse undergraduate experience. 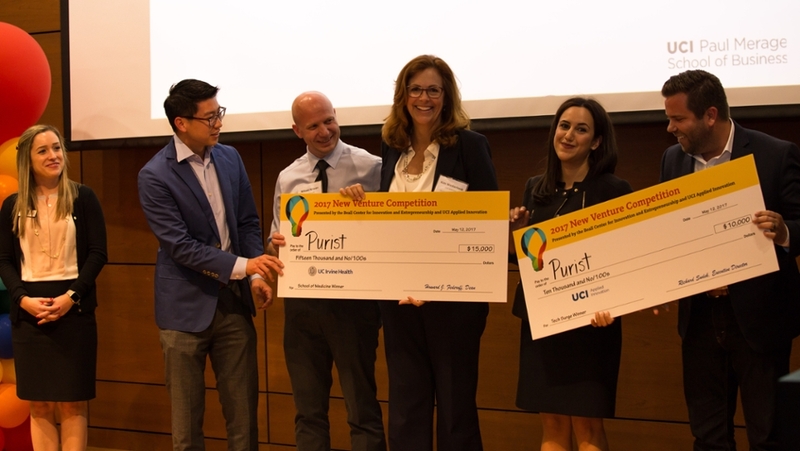 Last month, UCI’s Beall Center for Innovation & Entrepreneurship and Applied Innovation hosted the final round of the 2017 New Venture Competition, giving inventive Anteaters the chance to vie for cash and prizes totaling over $100,000 to launch their startup businesses. More than 40 teams from across campus pitched their brilliant ideas to a panel of judges made up of experienced investors, entrepreneurs and business leaders, and the 15 strongest were named winners. Among the most promising competitors at this year’s event: Purist, which provides radioactive ingredients for cancer treatment; Esqalate, which helps low-income and working-class individuals gain access to attorneys; and Venom-Aid, which produces a material that sequesters toxins delivered by a variety of snake bites. You can learn more about the competition and the winners here. Congratulations to our inspiring Anteater entrepreneurs! We look forward to seeing their businesses come to fruition in the months and years to come. UCI is a renowned leader in higher education, but our campus also works with local school districts to improve teaching methods that will put K-12 students on a path toward success. 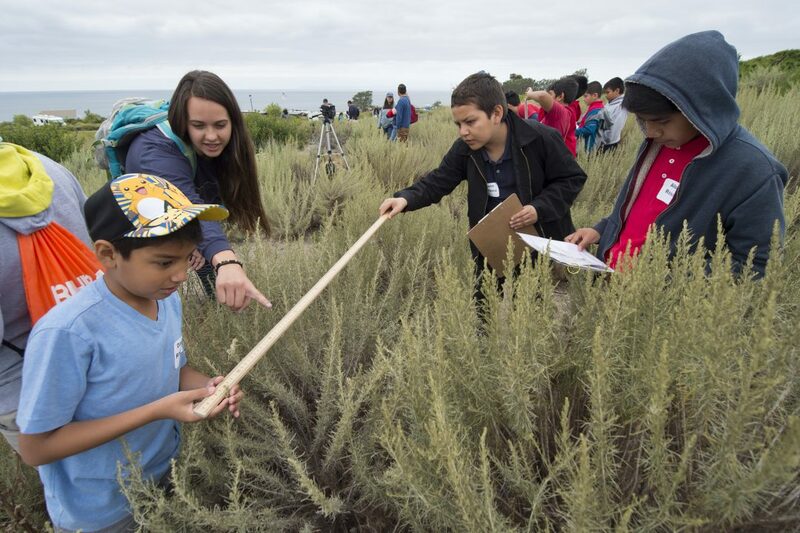 One example is a program developed by our School of Education, the UCI Center for Environmental Biology, the Crystal Cove Conservancy, Crystal Cove State Park and Orange County school districts to introduce fourth-, fifth- and sixth-graders to field research in a living laboratory. Accompanied by UCI undergraduates and armed with clipboards, gauges and meter sticks, students examine plant growth, water evaporation rates and soil moisture at Crystal Cove. Once they’ve collected the data, they return to their classrooms to analyze their findings, which will be used for ecological restoration projects at the park. Launched in 2015, Project CRYSTAL has brought together a community of scientists, teachers, undergrads and activists who instill a passion for interdisciplinary research, experiential learning and environmental stewardship in Orange County’s youth. You can learn more about it here. UCI researchers are leading the charge when it comes to forging new pathways to understand and treat disease. 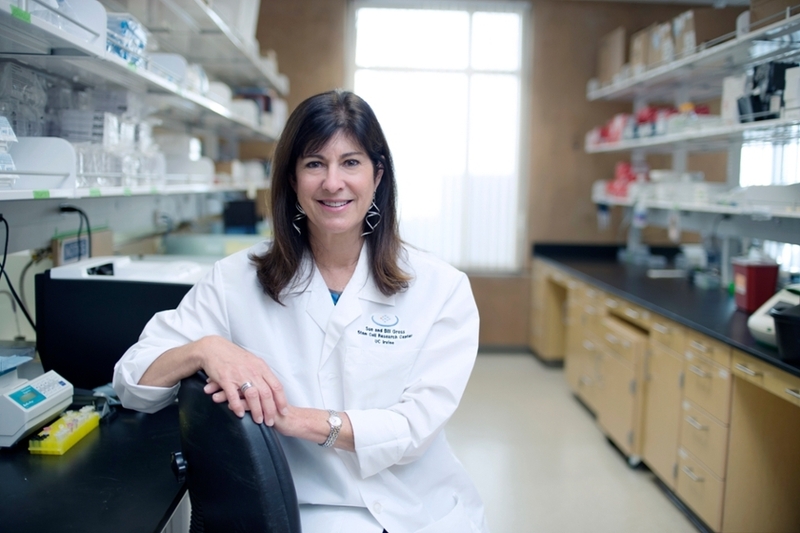 Leslie Thompson, professor of psychiatry & human behavior and neurobiology & behavior, and her fellow researchers recently discovered why Huntington’s disease patients have defects in the blood-brain barrier that contribute to symptoms of the disorder. By reprogramming cells from these individuals, Professor Thompson and colleagues from Columbia University, the Massachusetts Institute of Technology and Cedars-Sinai Medical Center learned that blood vessels in the brains of people with HD leak and have a diminished capacity to form new blood vessels due to the presence of a mutated protein. Professor Thompson hopes the findings can be used for future treatments to seal leaky blood vessels and evaluate drug delivery to patients with the disease. The UCI community is celebrating some terrific news for one of our stand-out student athletes, Keston Hiura. Last week, the award-winning infielder/outfielder on UCI’s baseball team was drafted by the Milwaukee Brewers. 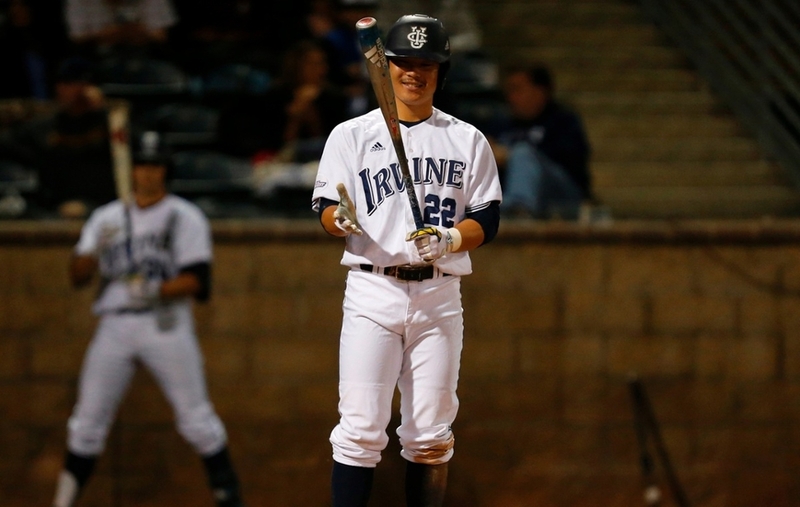 Earlier this year, Keston was named Big West Field Player of the Year, first team All-Big West and a Golden Spikes Award semifinalist after he broke a 46-year UCI batting record with a .442 average. He also finished the season as the nation’s top hitter and on-base percentage leader with a .567 mark. In an Orange County Register article this month, he spoke about his time at UCI, his upbringing and his excitement about his career. We’re incredibly proud of Keston and know he has a bright future ahead of him. While we’ll always root for the Anteaters, we may have to root for the Brewers too! Congratulations, Keston. Even though the Class of 2017 has packed up their belongings and turned their tassels, ready to embark on their new journey as freshly minted college graduates, the UCI campus continues to be a vibrant place throughout the summer. With the Los Angeles Rams returning for their annual training camp, hands-on STEM and arts-based educational programs for K-12 students and the ever-impressive New Swan Shakespeare Festival, UCI has something to offer for everyone. I hope you’ll spend this summer finding ways to further connect with the campus and discover the inspiring Anteater community that’s fueled by a common love of research, discovery, creativity and innovation and a desire to make a positive impact. 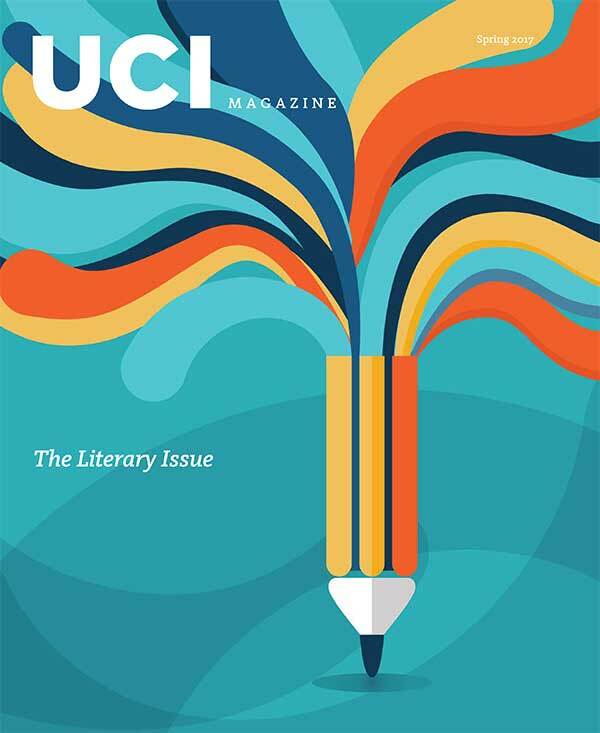 If you’re looking for a place to start, I’d suggest the new issue of UCI Magazine, which highlights our powerhouse M.F.A. Programs in Writing and features a new piece by award-winning author and Distinguished Professor of comparative literature Ngugi wa Thiong’o. Enjoy!